yep, you read that right, stinging nettle risotto - weeds basically, and it required a great deal of caution, and thick gardening gloves to remove the leaves from the stems and once all was done, the dish was amazing. 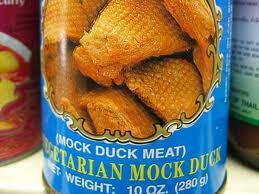 Meet Mock duck - available at your local asian grocer and loved by our family and people i feed it to before they realise what it is. of course you can do this with other meat sources, not sure what cause i don't eat them though. i had prepared my mock duck by dipping it in egg not, then panko, then frying in a shallow oiled pan, and after testing numerous pieces without my knowledge, my nephew decided that it was missing something, so on his advice of dipping it in flour like they do it at home, before the egg not, then the panko and frying in a shallow oiled pan it would be better, i cooked it again this week. the photo above is of the dinner that we had this week which was better due to my nephews tip. As for listening to your elders, that's phooey - it's the young ones who are open and honest enough to tell it like it is.